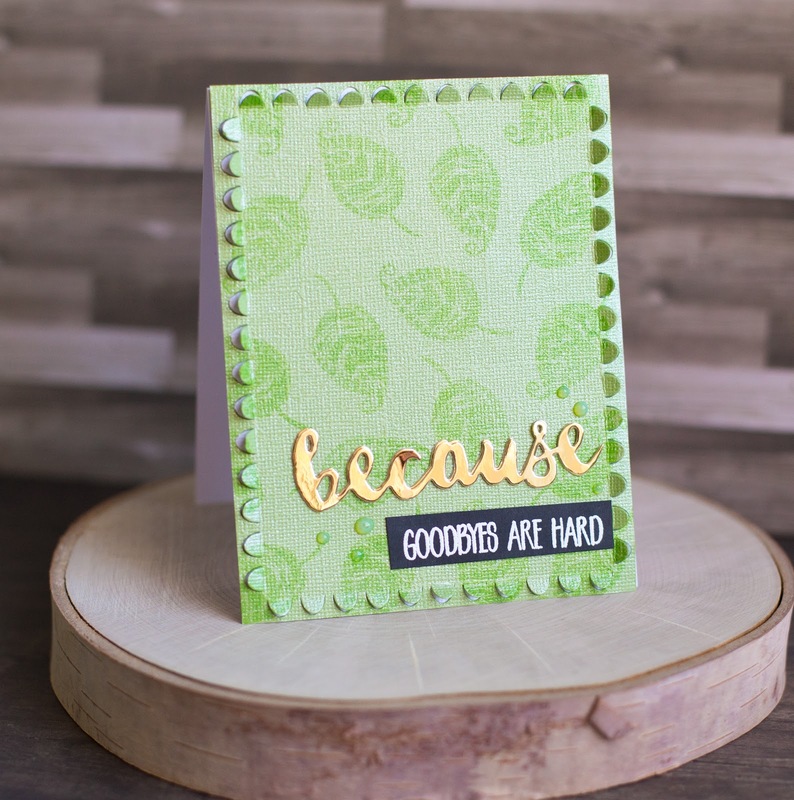 The CardMaker Magazine Blog and L'il Inker Designs teamed up to bring inspiration using L'il Inkers latest designs! I have two cards for you today featuring two different L'il Inker Stamp sets. For my first card, I used the Because Stamps, Because Word Die and Fringe Scalloped Rectangle Die. 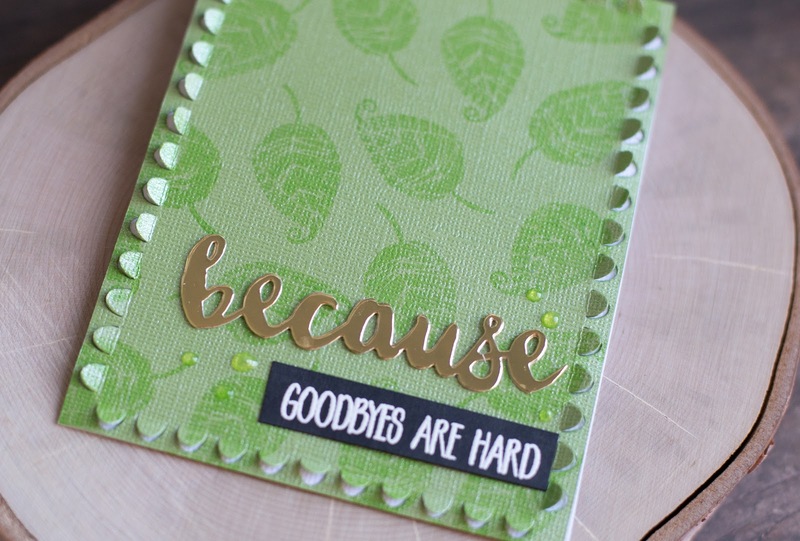 I stamped the leaf image from the Because Stamps repeatedly on some Green Shimmer Simon Says Stamp Cardstock. I love the tone on tone look of the background. I cut the scalloped edge out of my stamped panel. Then I used the Because Die to cut two layers of gold cardstock and adhered them together for some additional dimension. Finally I stamped the Goodbyes are Hard sentiment in Versamark ink on Black cardstock and covered it with Hero Arts White Embossing powder. I finished the card off with some droplets of Nuvo Jewel Drops. The fun thing about this shaker is that it is a window that you can see through to the inside of the card. Now it's time to talk GIVEAWAY! L'il Inker is generously giving away a $35 credit to their store! All you have to do is comment on all the blog posts in this hop and you'll be entered to win! So be sure to leave me a comment down below. Want another entry? Head over to my YouTube Channel and subscribe, then you can come back here and leave me a SECOND comment telling me you did! 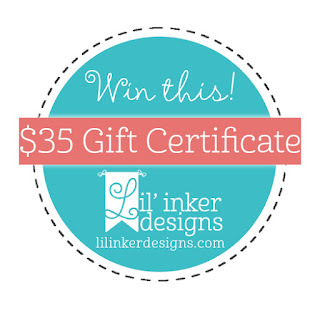 And now it is time to hop on over to Stephanie Gold's Blog where you will find more L'il Inker Inspiration and another opportunity to enter the giveaway! These are both such great cards! I especially love the gem shaker card---so fun! 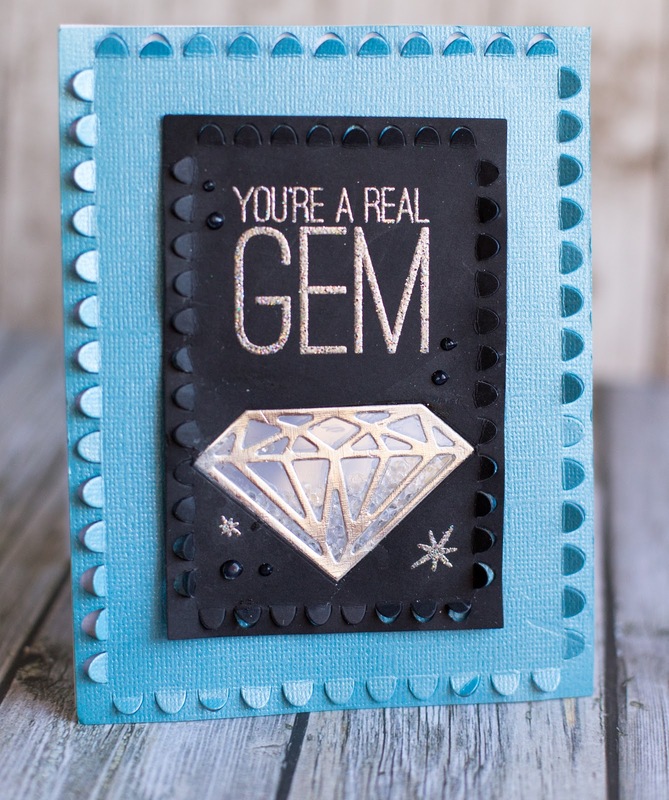 The scallop frame adds so much dimension and texture to your cards - love it! I love them both! Especially the green one. WOWZA!!!! I'm a little speechless right now! I just finished watching your video which was incredible and I am in love with the projects you made!!!!! Thank you so much for showing off these projects using your stamps and dies from Lil' Inker Designs. I'm so grateful!!!!!!!!! Thanks, Laura! I was so happy to be introduced to L'il Inker and have the opportunity to take part in this hop. 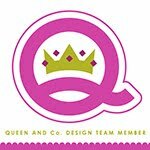 I love your designs! You will see more orders from me for sure!! Thank you :) :) I was only recently introduced to L'il Inker and my shopping list is now quite long too! The shaker card is awesome! I don't do shaker cards very often as for me they are so time consuming but when I look at your card I think I have to try it again. Same!! I usually use kits from Queen and Co. or Jillibean Soup to make it go faster, but this one came together pretty quickly considering it was from scratch! I LOVE the simplicity of these cards!! Oh my these are amazing! I love the colors and the fun punched out border! TFS and blessings! Wow, I love, love the fringe scallop die. Makes a real statement. Thanks for sharing. The scalloped fringe die is neat! What fantastic cards, Rebecca! I love the spring green on your first card. The background is awesome! Very cool cards! Love that scallop pop-up, it adds so much. thanks for the video, I couldn't picture a see-thru shaker before that! Love the beautiful green color 7 great design! Beautiful cards. I love the diamond shaker. Love your beautiful cards. Great die. Fabulous cards. Love the texture on the first one with the tone on tone. Love the raised scalloped edging. Two absolutely gorgeous cards! I love the great touches of metallic you added to them both! I'm a sucker for tone on tone- the green is simply beautiful! And what a FABO shaker on the second card! Thanks for sharing! both cards are beautiful! love the green one! Beautiful cards! I love the dies with the fringe scalloped edge.... those are definitely on my wish list! Such a fun look! Great cards. That shaker card is fabulous. Thanks for including the video. Wow! Beautiful cards and colors!!! Really adorable!!! 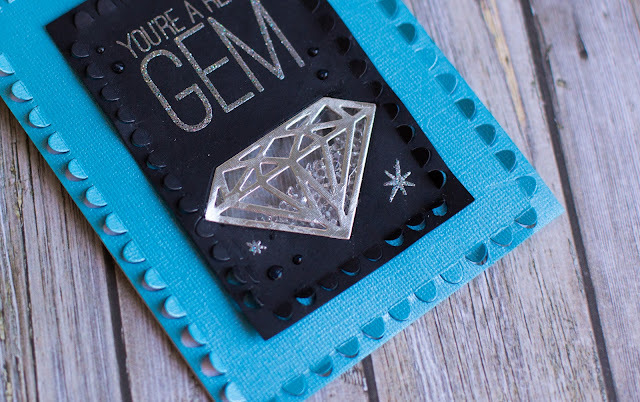 Gosh ...the projects really caught my eye and I put the Rectangular scalloped fringe die on my wish list. Super cool card! Love how it came out!!! Beautiful cards! I love your gem shaker card! I also love the backgrounds on both cards! I really like the pop-up dimension on this die and your fun metallic accents! The gold because is stunning and the diamond shaker is very cute! Thanks for sharing! Really gorgeous cards. Especially love the monochromatic look of the first card.